Been watching History Of Scotland on the BBC these past few weeks. Presented by Neil Oliver and his fab accent. Fascinating story. I’d love to see something like that on Dutch television, on our history. On a related note, I wanted to mention the Wikipedia page for Genetic history of the British Isles, which is fascinating and also reminded me that I’d like to take part in the Genographic Project, to find out more about my roots. After, what feels like an eternity, we’re currently experiencing a real winter here in The Netherlands. The hospitals are flooded with all kinds of injuries from inexperienced people attempting to go ice-skating. 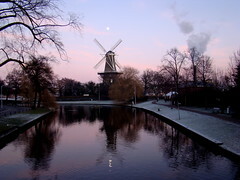 You can finds lots of great photos of Leiden on Flickr of try the ones my dad took of the area where I grew up. And then it’s 2009. The year I’ll turn 30. Where on earth has the last decade gone to? Anyhow, enough melancholy. It’s back to the salt mines tomorrow, which has me pondering the past 2 weeks of freedom. I treated myself to a Facial yesterday, which was a new experience for me. Must say, I really enjoyed it. And my skin feels great to. It was hard though, when it was over and I had to ride my bike through the freezing wind. Bit of an anti-climax. We’re going to see the new Jan Jaap van der Wal show tonight. Looking forward to that. Let’s see, what else? Oh, I wanted to plug the project I’ve working a bit during these past few weeks. It’s for the Dutch audience only, I’m afraid. It’s an interface for the bank transfers from the Postbank. I’ve made the source available, so if you want to add stuff, be my guest. Oh, and it contains pie charts! Goodie!